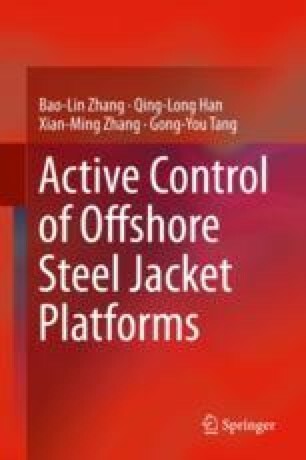 This chapter is concerned with active control for an offshore steel jacket platform subject to wave-induced force and parameter perturbations. The offshore steel jacket platform is shown in Fig. 2.2 [65, 72]. The dynamic model under consideration is given by ( 2.44 ). By intentionally introducing a proper time-delay into the control channel, a novel sliding mode control scheme is proposed. This scheme utilizes mixed current and delayed states. It is shown through simulation results that this scheme is more effective in both improving control performance and reducing control force of the offshore platform than some existing ones such as delay-free sliding mode control , nonlinear control , dynamic output feedback control, and delayed dynamic output feedback control . Furthermore, it is shown that the introduced time-delay in this scheme can take values in different ranges, while the corresponding control performance of the offshore platform is almost at the similar level.